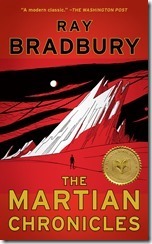 The Martian Chronicles - Bradbury's first science fiction novel - is less a novel than a collection of short stories. Each story has a different tone and very few characters appear in more than one story; but, they are tied together by presenting a chronological history of man's attempted colonization and terraforming of Mars in the near future. Bradbury's stories have endured because he humanizes the astronauts and the Martians - showing us their hopes and their flaws. Early explorers discover that Mars is populated by a race not dissimilar to their own: They are humanoid in shape and they live in cities and houses and they marry and have children. They even possess some of the flaws of their Terran counterparts. The first astronauts are killed by jealous husbands or by those who think them delusional for claiming to come from another planet; or by those looking to protect their home world. But the Martians are not like the Earth men. They are telepathic, and they are far less excited about contact with their sister world. Earth people came to Mars for adventure, for love, for land, for freedom. One came to exact revenge on those who had burned books on Earth - a precursor to Bradbury's second novel - Fahrenheit 451. Eventually, rockets from Earth swarm toward Mars, and the invaders try to re-shape the red planet into the world they left behind. The Martians are all but wiped out by the diseases brought by the intruders. But, just as the encroachers begin to take hold of Mars, a worldwide nuclear war erupts on Earth, halting the immigration, and drawing most of the settlers back home. It's not hard to see the parallels between earth's colonization of Mars and European colonization or America conquering the western frontier. The Martian civilization lasted for thousands of years before it was wiped out by us. Earth's replacement civilization lasted about a quarter century. Bradbury has a talent for building into his stories allegories about race and imperialism and the Cold War and Nuclear War and Family values and cultural clashes and the dangers of rapid technological advancement. Despite an optimistic final story, The Martian Chronicles is a warning of man's callous, careless, reckless, and self-destructive nature. "We Earth Men have a talent for ruining big, beautiful things. The only reason we didn't set up hot-dog stands in the midst of the Egyptian temple of Karnak is because it was out of the way and served no large commercial purpose."